Decrypt SQL stored procedures,triggers, views and user-defined functions - using. SQL Script Recovery is consequently very easy to use. Before you use it,you need to login to a SQL Server.You need to enter server name (you may use "(local)" to access a locally installed server), and possibly a login name and a password, unless you are using NT authentication (SSPI).After having done that,the application will be able to access database.Selecting that you will login database in dropdown box.When everything has been entered, proceed by clicking on the Ok button. Note:You will need a account that are members of the SysAdmin role to recover your own script. After a sucessful login,a dialog with some tab containing encrypted entries will be displayed.You can select Stored Procedure ,View,Trigger or User-defined Function(only with SQL 2000) by clicking one of tabs.Then you can select one item in grid,press the Recover toolbar button. After working completely,Result window will be display.Recovered source code is displayed in Textbox.You can paste it into SQL Server Query Analyzer or into your favorite text editor to examine or edit it further by clicking Copy button. If you want to save, proceed by clicking Save button,You will be prompted for a file name , and you will always be asked if you want to overwrite an already existing file, should you choose one.Text will be written to a runnable SQL-file, i.e. 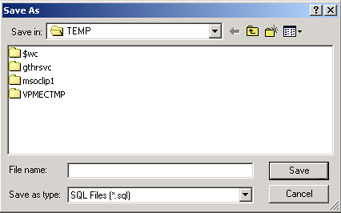 you will be able to load it into a SQL utility such as SQL Server's Query Analyzer and run it.